I was recently asked – What is the best baby soap for fairness in India? Frankly, I was a bit taken aback by the question wondering if there are really fairness soaps for babies in the market. I did some digging to find the fairness baby soaps and this is what I found. There are several categories of soap in the market & we usually get confused what to choose. Categories like Organic, Ayurvedic, Medicated, Anti-Bacteria, etc. Soap companies stamp such big words to attract traffic. However, it’s our responsibility to select the best for our child. Isn’t it? Baby’s skin is extremely sensitive as compared to teenagers or adults. There are many baby soaps available in the market but selecting the best is really a difficult task. So if you are thinking which baby soap would be best for fairness, stick with me till the end. A baby’s tender skin needs care and extra supervision. We just can’t risk any product on a baby’s skin. Babies have weak immunity. They are more prone to infections & bacteria. So, parents need to be cautious about their infant’s skin. Pediatricians often recommend not going for soaps until the infant turns 1 year old. Till that time you may use mild baby washes. How to choose the Best Fairness Soap for Babies? Disclaimer: A person’s colour completely depends on his/her genetics/DNA & melanin. Soap won’t make a difference in a babies color. However, soap can help cleanse the skin & display the best. Washing skin with soap removes dead cells & cleans pores. Soap won’t make your baby fair but it will just enrich his colour grade a bit accompanied by clean face. Always go for gentle soaps that are non-toxic & free from harmful chemicals. Using a harsh soap might cause skin rashes or skin irritation. Mild soaps are best. Never select extra lather soap because they would probably have chemical content high. We would recommend you to use fragrance-free baby soaps. Babies usually start crying if they dislike soaps fragrance. And, fragrance soaps usually contain harsh chemicals that might affect your child’s skin. Go for Hypo allergic soaps if your baby has hypersensitive skin or is suffering from dry skin or eczema. But consult a doctor before selecting medicated soap. Always check a soap’s ingredient & search on the internet. Few ingredients might cause allergic reactions. So checking content is important. Natural ingredients soaps are best, check for things like Almond, Milk, Honey, Olive oil or other natural things. You might have got an idea about how to select baby soap. Well on the basis of the previously discussed topic, let’s go for soaps. 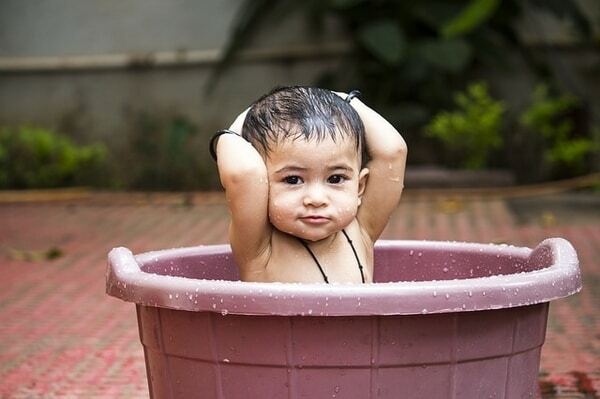 Here’s a list of 5 soaps which are best for babies in the matter of fairness & cleansing. So wasting much time let’s get started. KAMA is really well-known as well as a reputed company in the Ayurvedic sector. Their products are quite expensive but free from side effects & are completely safe. People usually trust Kama because of its original content. Kama has not released a lot of products for baby, especially in soaps. But their products are really trustworthy. Ayurvedic formulated soap with a deep blend of coconut, castor & sunflower oil. This soap cleanses your babies skin & protects it too. The soap is formulated with antibacterial turmeric & cedarwood (antiseptic) extracts to protect your babies delicate skin. Moving to other ingredients comes Ashwagandha, this natural content soothes & calms sensitive skin or inflammation. You may love this soap if there’s any rash or roughness on your babies skin. Extracts of Dill & Nutgrass are best to repair rashes, roughness or dryness. The soap isn’t scented & is creamy, opaque, and milky in appearance. Rich in Vitamin E & A, accompanied by coconut oil, castor oil, nutgrass, dill, turmeric & sunflower oil. The soap also has Beeswax content in it which makes it more Vitamin A rich. KAMA Baby Soap Nirav is really a perfect product for moms with their new toddlers. Suitable for all skin type & devoid of chemicals. However, the soap is a bit expensive but absolutely safe. The Kama has listed 2 massage oil for babies, Pre-Bath & Post-Bath. This oil claim to give your baby a natural glow. The products are expensive but nothing can be expensive than your new one. Sebamed is a German baby product manufacturing company. The company is well-known for all baby related accessories in the medic sector. You can get everything ranging from soaps to shampoo over here. Sebamed Cleansing Bar isn’t basically fairness soap but hydrates & moisturizes the skin. The soap is a cleansing bar that keeps your baby’s skin safe, soft & healthy. There are no harmful chemicals included in the soap, entirely natural content. Additionally, the soap ensures your babies pH value i.e. 5.5 & doesn’t let it dry. Suitable for every skin type, let it be Dry, soft or sensitive. You can use this soap even if your baby is having some sort of skin disease. You can use Sebamed bar without any worry. This soap would definitely cleanse your babies skin & won’t allow Skin related diseases. However there aren’t any side effects reported, so it seems to be completely safe. Also, the soap won’t be able to create much lather that indicates the absence of harmful chemicals. The soap won’t have any fragrance & won’t pain your baby even if it enters his/her eyes. Overall a must buy soap because even if it doesn’t make your baby fair, the soap won’t harm him. The soap will keep your baby’s skin completely safe. Johnson’s has been a well-reputed company in baby products. Maximum Indian population has been using Johnson’s baby products because people trust them. The Blossom series claims that the soap is enriched with 1/4th baby lotion & vitamin e that helps to moisturize the baby skin. The soap isn’t harsh & won’t irritate your babies skin. Blossoms series soap has got fragrance but there’s nothing to worry. The fragrance is due to lotion & vitamin E content. Vitamin e is really an essential component of skin enrichment. According to Johnson’s the soap is Dermatologist tested & approved by 5 level safety tests. The soap is mild with delicate floral fragrance accompanied by an easy grip. Overall the product has been rated as 4.3 out of 5. Baby Milky Soap is a product of Pigeon Baby Products. The soap is enriched with major cleansing agents but especially with milk protein. The milky soap contains 3 major ingredients that are completely safe. Firstly, Jojoba which is a natural moisturizer that helps prevents dryness. Second, Chamomile Extract which is a natural soothing agent that helps to relieve irritated skin. Additionally, Olive Oil which is a well-known natural emollient that easily absorbs & deeply moisturizes the skin. In simple words, the soap is enriched with Milk, Shea butter, Vitamin A, Vitamin E, Jojoba, Chamomile Extract & Olive oil. People have used it & reviewed it as safe. Babies like its fragrance & the soap won’t hurt them if accidentally goes in the eye. However, every child is different & fragrance taste might also differ. But maximum babies have positively reacted to this product. Softsens Baby Natural Bar is made up of rich emollients like almond oil & natural honey. The soap cleanses & nourishes your baby’s delicate skin with no harm. Baby’s skin gets hydrated, happy, cleansed & delighted. The soap claims itself to be free from paraben & other harmful chemicals. Dermatologically tested this soap enriched with almond, honey & vegetable oil makes it safe for babies. Suitable for all skin types Normal, Dry or sensitive. The soap is reasonable & comes in a 75g pack. Chicco is an Italian baby care product brand which is well-reputed for manufacturing products for babies aged from 0 months to 3 years. The soap is clinically tested & is suitable for sensitive skin too. There is no Paraben, SLS or SLES, Dye or alcohol content in the soap. Also, the soap falls in the hypoallergenic category which means that soap has been formulated to minimize the risk of skin allergies or disorder. There’s a usage instruction with the soap. If on off chance soap enters the baby’s eyes, clean it immediately. Because the product recommends avoiding contact with eyes. The soap doesn’t claim to improve skin complexion. But safety should be on high priority than getting fair complexion. These were few of the best fairness & cleansing soaps for babies. We have reviewed 6 soaps but according to me, KAMA was the best. Accepting the fact that it’s expensive but the Kama is best among rest. Chicco has been ranked last because of its caution to avoid contact with the eye. It’s all up to you which one to select, every soap is safe. It’s never wrong to search for things that can make your baby fair. But there are no such things that can change your baby’s complexion, it’s natural. However, surgery is the only option if you are greedy of colour (Eg: Michael Jackson). But going for such options is really a nuisance. An important notice to all parents, accept your baby in the way he/she is. Don’t let their mind think this discrimination or color level. Soaps or lotions can upgrade their complexion a bit by clearing out germs & clarifying their face. People tend to take tablets or steroids to become fair, this might seem good while starting. But for a long run, you will surely face those side effects. So buy soaps for your baby or child but keep in mind no soap can make a person completely fair. Overall, don’t let your child’s self-esteem be destroyed just by making him/her remembering their color. That’s all!